Book an appointment with our Vancouver paint correction experts. We’ll inspect your vehicle and provide an estimate. Paint correction is a broad term used to describe the removal or dramatic reduction of many car paint imperfections, including: car scratches, swirl marks and so called “spider webbing” marks, acid etching, oxidation and fading. The majority of these imperfections are contained within the clear coat – the transparent top coat above your vehicle’s paint layer. 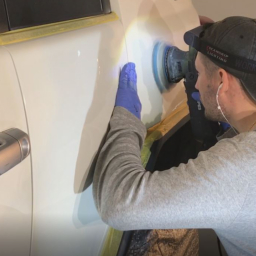 During paint correction, a technician removes these imperfections from the clear coat by cut-polishing and wet sanding, then finishes the process by applying a protective ceramic coating that hardens the clear coat and thickens the protective layer – safeguarding against future scratches, etching and fading. 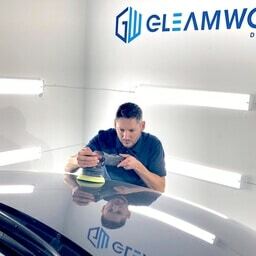 Gleamworks Detailing uses Opti-Coat ceramic coating, which not only protects the car’s finish, but also results in a dazzling, reflective, high-gloss finish. The services most often requested by our Vancouver and Richmond paint correction clients are car scratch repair and paint touch ups. As described above, if car scratches are at a shallow to moderate depth within the clear coat (and most are), they can usually be completely removed by “compounding” (cut polishing) and wet sanding. 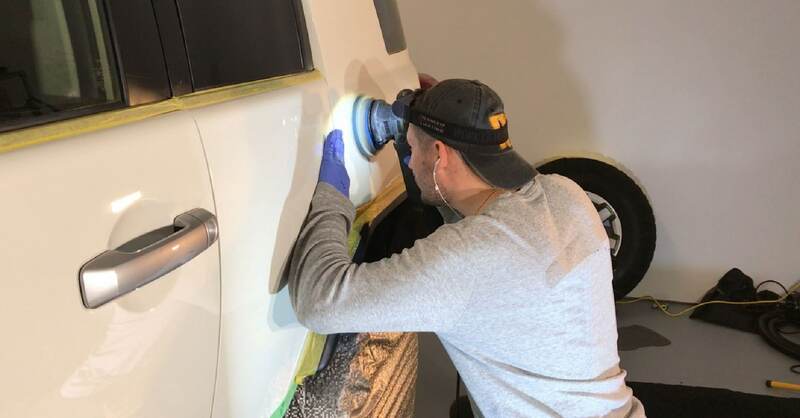 If scratches are deep – penetrating the paint layer beneath the clear coat – cut polishing followed by a ceramic coating dramatically obscure scratches, making them difficult to detect and making costly repainting or paint touch-ups unnecessary. Paint correction and car scratch repair are part of Gleamworks Opti-Coat and detailing packages. Gleamworks uses special solutions that dissolve tar and soils, oily road grime, old wax, soap scum and water spots. We then rinse your car using a special no-rinse car washing product, which leaves no soap scum or residue. Your vehicle’s clear coat is compounded (cut polished), removing thin layers of top coat and the imperfections they contain. In addition to cut polishing with a rotary polisher, hand wet sanding may be used in more difficult areas. 2 or more cuts of compounding may be necessary to remove the majority of scratches, swirl marks and oxidation marks. We always leave at least 20 microns of clear coat untouched, so your car’s paint layer remains protected. Finish polishing with a rotary polishing machine and microscopic abrasives suspended in liquid or paste removes micro-scratches and remaining imperfections, leaving a smooth, shiny surface that is ready for a protective coating. Finally, we apply either Opti-Coat Pro or Pro Plus, or, a quick ceramic wax application. Ceramic coatings protect your vehicle’s surface from scratches, road dirt, bird droppings, chemicals, water spotting and harmful UV rays which can fade paint. Not only do ceramic coatings protect your vehicle's finish, they result in a mirror-like finish that gleams. Will paint correction remove swirl marks? Swirl marks can be removed with compounding and final polishing. Does paint correction remove most scratches? Scratches that are at a safe depth within the clear coat will be removed by cut-polishing with compounding. Cut polishing, polishing and coating dramatically reduce the appearance of deep scratches that are within the paint layer itself. Can you remove acid etching caused by bird droppings and chemicals? Yes we can. 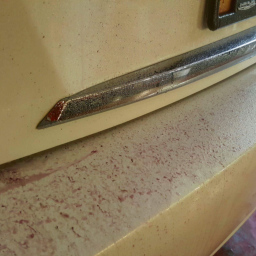 Acid etching from bird droppings (and other chemicals) is usually superficial damage in the clear coat and not in the paint layer. Compounding and/or wet sanding will remove the acid etching. How much does paint correction and car scratch repair cost? For paint correction pricing, view Gleamworks Opti-Coat packages and auto detailing packages. Paint correction is a vital part of these services. How long do paint correction and car scratch repair take? 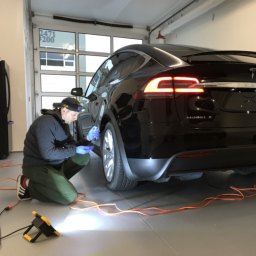 Paint correction and car scratch repair can take anywhere from a half day to three days, depending on the amount of surface damage and the type of package you choose. Where is your paint correction shop located? Gleamworks is located in an area that is convenient to both Vancouver and Richmond residents. Our clients come to us from all over the Lower Mainland, including Vancouver, Richmond, Surrey and Burnaby. View a map and directions.